Intramuscular manual therapy, also known as trigger point dry needling, can be an effective alternative to traditional treatment methods for eliminating chronic pain caused by trigger points. Dry needling can be used for a variety of musculoskeletal problems. Any areas where muscles are sore or active trigger points are identified may benefit from dry needling. This is an advanced procedure that requires additional training, including greater than 54 hours of intensive course work. Physical therapists at Bon Secours In Motion utilize the Myopain Seminars for their education. Dry needling differs from acupuncture in that acupuncture uses needles placed in acupuncture points in the skin that correct imbalances of flow or ‘qi’ through channels, known as Meridians, whereas dry needling attempts to decrease pain by needling individual trigger points. The philosophies and intent of both interventions are very different. In the US, dry needling is a relatively new method for treating myofascial pain and not everyone is aware of this effective modality. Dry needling is a therapeutic procedure in which a solid filament needle is inserted into the skin and muscle directly at a myofascial trigger point to decrease or eliminate local and/or referred pain. A myofascial trigger point consists of multiple contracted knots which are related to the production and maintenance of the pain cycle. 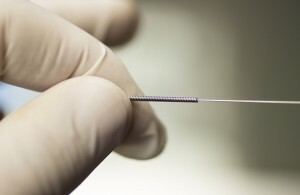 Most patients do not feel the insertion of the needle. The local twitch response elicits a very brief (less than a second) painful response. Some patients describe this as a little electrical shock; others feel it more like a cramping sensation. The elicitation of local twitch responses is a desirable reaction because of the positive therapeutic response. Only single-use sterile disposable needles are used. Most patients report being sore after the procedure. The soreness is described as muscle soreness over the area treated and into the areas of referred symptoms. Typically, the soreness lasts between a few hours and two days. Typically, it takes several visits for a positive reaction to take place. Again, the goal is to try to cause mechanical and biochemical changes without any pharmacological means. Therefore, a cumulative response to achieve a certain threshold after which the pain cycle is disturbed is expected. Depending on the amount of soreness the individual experiences in response to the treatment, it is recommended that the patient applies heat or ice over the area, as well as perform gentle stretches and modify general activities. Questions? Contact one of our locations for more information on this therapy.